CRICKETER Tshepo Legodi is swapping his cricket boots for running shoes on Sunday to run in the Virgin London Marathon. Paceman Tshepo, who is 35 and will be playing for Shaldon this season, is running on behalf of Leukaemia Care. He warmed up last weekend by running the Plymouth Half-Marathon, getting round in 1.51.56 for 1,462th out of nearly 5,000 runners. Tshepo said everyone has friends or relatives who have fought cancer in one guise or another, which is why he is running to raise money for research into the disease. 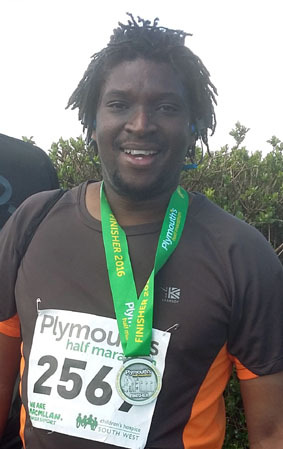 “My way to help keep the fight going is by running the race on behalf of this worthy cause,” said Tshepo, who has played for Tavistock and Exeter during a Devon League career that dates back to his time as student at Kelly College. “My goal is to raise £2,000 and I am asking for help to get me up to this target. Tshepo got the running bug last year, but has never run in a marathon before. “Last year I decided to compete in the Great West run and completed my fist half-marathon,” he said. To help Tshepo reach his target, visit www.justgiving.com/Tshepo-Legodi and leave a donation.